Our room layouts comprise studio, 1 and 2-bedroom units, 6 with spa baths. All are ground-floor and smoke-free. Off-street-parking at your unit door. Cooked, continental and light breakfasts delivered to your unit on request. We provide free unlimited Wireless Internet for our guests, Sky 50+ Channels TV and corporate charge back facilities from most of the popular local restaurants. This very spacious non-smoking suite has a separate bedroom containing a king size bed and Freeview TV. The large lounge area has a single bed, a comfortable two seater settee, arm chair and dining furniture. It also has 'Sky Guest Select' TV (50+ channels), free wi-fi, direct dial telephone , radio alarm clock, heating,ironing board and iron. The kitchenette has a twin cooktop, fridge, microwave, toaster and a large range of complimentary teas, coffee and hot chocolate. The en suite bathroom has a large corner spa bath with overhead shower, hand basin, mirror and hair dryer, and a separate toilet. These very spacious non-smoking units have a separate bedroom containing a king size bed. The large lounge area has a single bed, a two seater bed-settee, arm chair and dining furniture. It also has 'Sky Guest Select' TV (50+ channels), free wi-fi, direct dial telephone , radio alarm clock, heating,ironing board and iron. The kitchenette has a twin cooktop, fridge, microwave, toaster and a large range of complimentary teas, coffee and hot chocolate. The en suite bathroom has a large corner spa bath with overhead shower, hand basin, mirror and hair dryer, and a separate toilet. This very spacious non-smoking unit has a separate bedroom containing two single beds. The large lounge area has a queen size bed, a comfortable two-seater settee and dining furniture. It also has 'Sky Guest Select' TV (50+ channels), free wi-fi, direct dial telephone, radio alarm clock, heating,ironing board and iron. The kitchenette has a twin cooktop, fridge, microwave, toaster and a large range of complimentary teas, coffee and hot chocolate. The en suite bathroom has a shower, hand basin, mirror and hair dryer, and a separate toilet. These very spacious non-smoking units have two separate bedrooms. One unit has a bedroom containing a super-king size bed with the second bedroom having three singles, while the second unit has a queen size bed in one room and a queen and single in the other. The large lounge area has two 2-seater settees and dining furniture. The units also have 'Sky Guest Select' TV (50+ channels), free wi-fi, direct dial telephone , radio alarm clock, heating,ironing board and iron. The kitchenette has a twin cooktop, fridge, microwave, toaster and a large range of complimentary teas, coffee and hot chocolate. 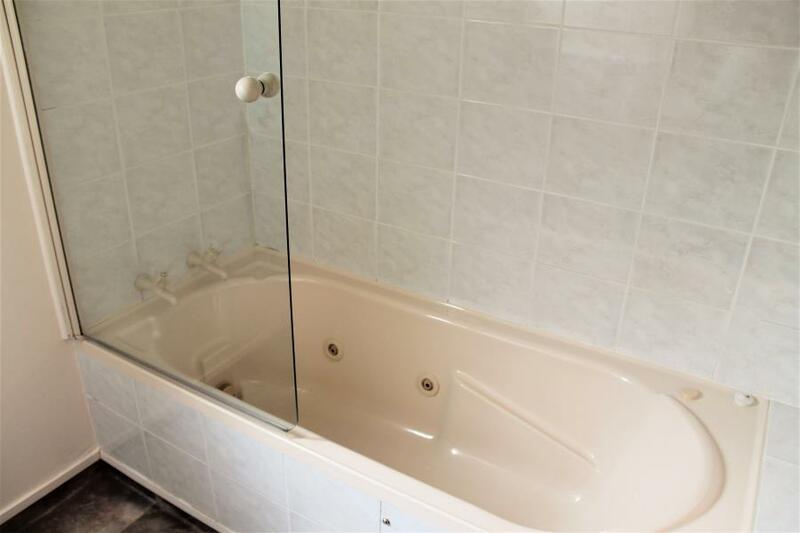 The bathroom has a standard spa bath with overhead shower, hand basin, mirror and hair dryer, and a separate toilet.